Under the sky of Ventura, California Rebecca and Nicholas had a romantic garden wedding in Rebecca’s grandmother's house. Their special day was captured by Kristen Grinnell Photography. 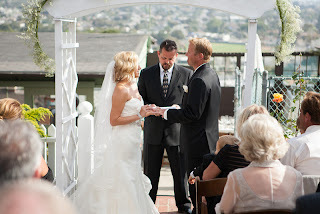 The bride is the third granddaughter to be married at this beautiful vintage home overlooking the Pacific Ocean. The wedding party was formed by Nicholas’ twin sisters, his brother and Rebecca’s twin brother. Family and friends gathered to celebrate their marriage.